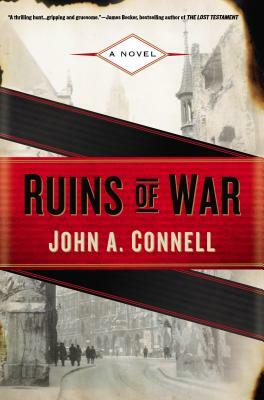 Home » Blogs » andrea@bookculture.com's blog » Q&A with John Connell, author of "Ruins of War"
Q&A with John Connell, author of "Ruins of War"
We're so excited that John Connell is stopping by next week to sign some copies of Ruins of War. Be sure to stop by our Columbus store to get a copy. John also took the time to answer some of our questions about his work. Check out his answers below! How did you come to write Ruins of War? The idea for setting Ruins of War in post WW2 Germany came during my research for a previous 1940s thriller that now lies dormant somewhere on my hard drive. In that story Mason Collins was the villain. He possessed deadly skills, yet exuded charisma, like a Jack Reacher gone bad. I found him so compelling that I decided to write a new story and make him my hero, while keeping his dark side that is only kept in check by a strict moral code. In that original book, Mason’s back story went back to crimes he’d committed in post WW2 Germany. While reading all I could get my hands on about the subject, I discovered the fascinating and turbulent history of post-World War Two. The Germans called the time just after the war Die Stunde Null, ‘The Zero Hour.’ Germany had been bombed back to the Middle Ages, where every major city and many towns and villages, railroads, bridges and industry had been damaged or destroyed. Close to 10 million Displaced Persons—the people brought into Germany from every conquered country to work as domestic, agricultural or industrial slaves—along with the tens of thousands of POW and concentration camp survivors were all suddenly freed and making the trek home or wandering the countryside. The black market thrived, and criminal gangs of deserted allied soldiers, former POWs and corrupt DPs roamed the countryside. Much like Jack the Ripper terrorized London, the killer in Ruins of War terrorizes post-WW2 Munich, and while I was researching what Munich was like seven months after the defeat of Nazi Germany, I discovered that most of the destruction had been caused by the numerous Allied firebombing raids. Unlike Berlin or Frankfurt, where whole sections of those cities were nothing but piles of rubble, Munich’s cityscape consisted of row upon row, street after street, of burned-out buildings. I thought, how nightmarish it would be have a serial killer loose in that devastated city with thousands of places to hide and a half million helpless prey. And how seemingly impossible would it be for Mason Collins to hunt down a psychotic killer in the chaos and ruins. I just finished Lee Child’s Personal, which has become one of my favorites of his books, and I’ve just started David Morrell’s Inspector of the Dead. I can’t say much about it as I’m only a few pages in, but promises to be as good as Mr. Morrell’s Murder as a Fine Art. I loved how he envisions mid-19th century England and his portrayal of the fabulous Thomas de Quincey. It would be impossible to narrow it down to one personal favorite. The books I have the greatest fondness for are those I read in my impressionable youth: H. G. Wells, Jules Verne, Arthur Conan Doyle, and, on the other side of spectrum, Charles Dickens. They were the ones to first instill my love of storytelling. Later, Dashiell Hammett and James M. Cain (and Arthur Conan Doyle) drew me to crime novels, and I enjoy anything by John Le Carré, Graham Greene, Nelson DeMille, and Umberto Eco. Sorry I couldn’t be more specific. I love so many books! The Crossing by Michael Connelly. He’s a master! Spoils of Victory, the 2nd in the Mason Collins series comes out in February 2016. This time Mason is posted in the small town Garmisch-Partenkirchen, which became the home of fleeing war criminals, making it the final depository for the Nazis’ stolen riches. There are fortunes to be made on the black market. Murder, extortion, and corruption have become the norm. It’s a perfect storm for a criminal investigator like Mason Collins, especially when it appears that a group of powerful men are taking over the lucrative trade. Determined to uncover the truth, Mason plunges into a shadowy labyrinth of co-conspirators including former SS and Gestapo officers, U.S. Army OSS officers, and liberated Polish POWs.